A part of my garden won't grow anything well. The north side of my garden won't grow any veggie well. This includes potatoes, beans, peas, carrots, lettuce, beets and parsnips. My soil tends to be higher clay but have been adding a compost material to it for the last 2 years to try and help increase the amount of nutrients and lessen compaction. 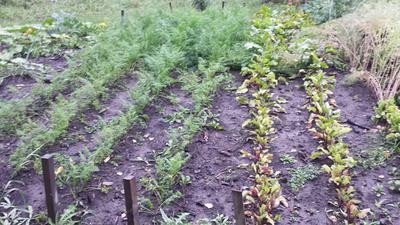 There is a defined line from where my garden does well to where it does poorly. This portion of the garden does get about 6 or 7 hours of sun each day but it is about 15 feet from the forest. Comments for A part of my garden won't grow anything well. Bad patch in my garden where plants don't grow well. The few weeds in your problem area look healthy! But definitely the veg are suffering. If it's not the weather in that particular part -- such as rain, wind or sun, then there must be something in the soil. You could do a soil test by either buying a test kit, or taking/sending a sample to your nearest center or local organisation that does this. It may be that there has been some contamination there in the past, or a particular batch of compost or manure had weedicide in it. Try growing some seedlings in a pot with the soil from that area. You could do a major soil replacement job, by bringing in new soil or building a slight raised bed and adding new soil. You could dig down and see if any large tree roots are running underneath that area. Maybe there was some spray drift of weedicide that blew into your garden. Thanks for your comments Megan!